I'll be honest with you. I didn't know much about Pearl Harbour before heading to Hawaii. Sure, I'd learnt a little bit in school history classes - but not a lot - and really, there's no better place to learn about Pearl Harbour than at Pearl Harbour itself. So on one of the first days of our trip, we took our rental car and drove out to Pearl Harbour to do just that. But before we get to Pearl Harbour - can we appreciate the gorgeous view and the gorgeous day we awoke to at our apartment?! Heaven! Is it any wonder we fell in love with Darmic? We arrived at The Pearl Harbour Visitor Centre (with our bags, because we didn't realise you couldn't take handbags/backpacks onto the site - they do have storage for bags for $4 per bag outside the entrance though so that's what we did) and headed straight to the shuttle station where we waited for the bus. 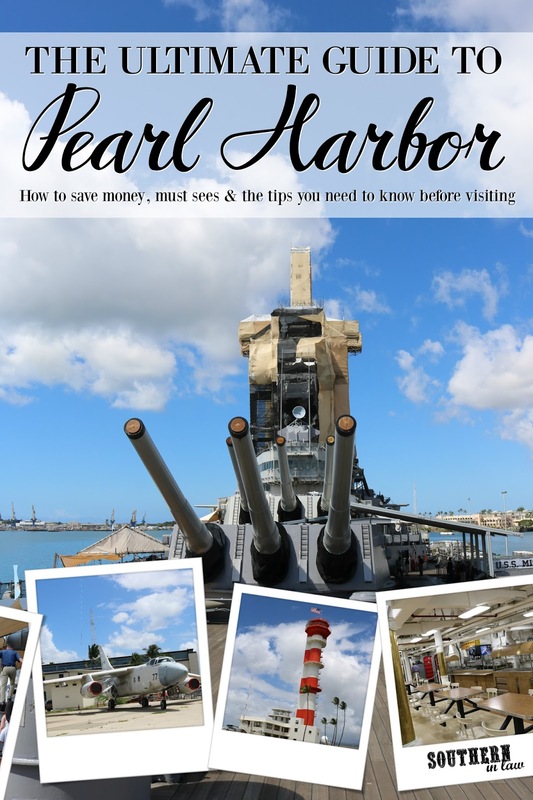 We were taking the bus out of the visitor centre and over to Ford Island where we would be getting on board The USS Battleship Missouri - also known as the Mighty Mo - for a guided tour. The USS Missouri rests in Pearl Harbour in "retirement" of sorts, after a history of war and protection. 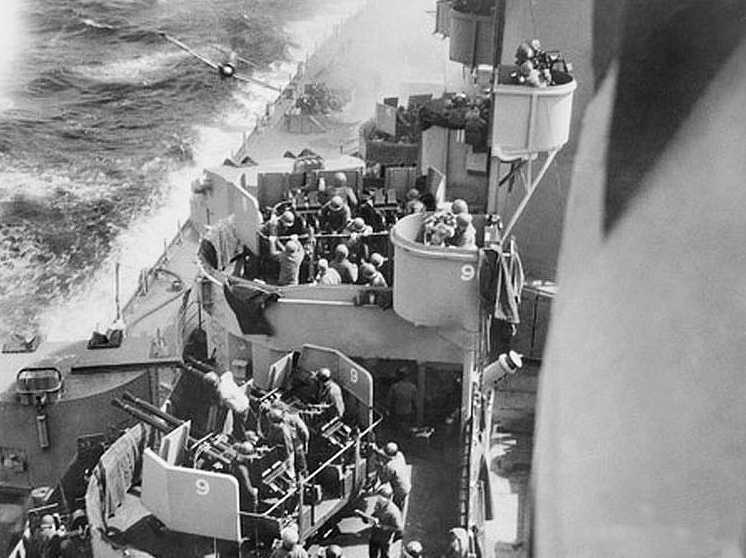 The USS Missouri is famously known for two things; April 11 of 1945 where it was struck at sea by a Japanese Kamikaze pilot during an airstrike. The attack caused minimal damage but it was that attack where the above photo was taken. The photo was actually taken by a baker on the ship who just happened to be playing around with his camera at the time of the attack. One of the most interesting things about this attack was actually how the crew handled what happened next. Whilst cleaning up the wreckage from the attack, the crew came across a body. The body of the kamikaze pilot. In an incredible showing of love your enemy, the captain ordered a proper military sea burial for the pilot with full honours. The crew made a makeshift Japanese flag to wrap around the body and he was given an honourable burial - even though he was their enemy. 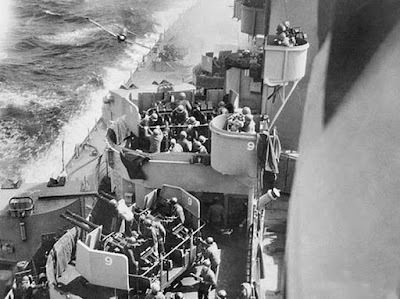 The next moment to really put the USS Missouri in the history books was the signing of the peace treaty aboard the USS Missouri - which marked the end of World War II. Docked in Tokyo Bay alongside 250 other warships, the USS Missouri welcomed representatives from Japan, the United States, China, Britain, the USSR, Australia, New Zealand, Canada, France and The Netherlands signed the peace treaty with Supreme Commander MacArthur saying "It is my earnest hope and indeed the hope of all mankind that from this solemn occasion a better world shall emerge out of the blood and carnage of the past" - and with that, the most devastating war in human history ended. The tour was fascinating and our guide shared so many things I don't think we would have otherwise learnt. After our tour above deck, we headed to the decks below where we got to see what life was like aboard the USS Missouri. Also in the lower decks were a variety of different exhibits where we read the last letters from Kamikaze pilots to their families, learnt about different things that happened during the war and learnt more about life on the ship. There was so much to soak up and we spent a good two hours wandering around and soaking it up. At the end of the tour we headed back on the bus - where we could of continued onto the Pacific Aviation Museum (which is a separate ticket but you go on the same bus and I think, from memory, you can buy a combo ticket) but we decided to leave the Pacific Aviation Museum for a separate day. A week later, whilst on the North Shore, we drove the half hour drive back to Pearl Harbour to do just that. We were heading to the Pacific Aviation Museum to do the Aviator's tour and I cannot recommend it enough. Our guide, Jerry, was amazing. An ex navy pilot himself, he was incredibly knowledgeable and shared so much more with us than we would have learnt on our own. We got a 2 for 1 ticket as they were running a promotion - but usually the Aviator's tour is just $10 more per person than the usual ticket price - and it's worth every penny. I don't want to tell you too much about either of these tours as I don't want to ruin them for you - so how about I let some photos do the talking? Incredible to think that Amelia Earhart may have never disappeared should she not have crashed on her first attempt in Oahu. After crashing at takeoff on the Ford Island runway, she decided it might be better to attempt her flight around the world from the other direction - ultimately leading to her disappearing without a trace. Bullet holes in the windows at Hangar 79 - still there from there day of the Pearl Harbor attack! If you're planning on going to the USS Arizona Memorial, book tickets online. Tickets are free regardless, however, when reserving your tickets online you will have to pay a $1.50 booking fee per ticket. This is totally worth it because otherwise you may find yourself arriving at 9am and only able to get a ticket for the 2:30pm session. Keep in mind, if you book your tickets online your tour may be cancelled. On the day we were booked for it we were in the theatre watching the documentary when the weather changed and our trip out to the memorial was cancelled. You're at the mercy of the weather but even if your boat trip is cancelled, watch the documentary as it's so informative. Sure, they cost a little bit extra - but they are worth every penny. A guided tour will see your learning and understanding so much more than you would if you were walking around on your own or listening to the audio guide. When we went to the Pacific Aviation Museum they had a buy one get one free offer on all tickets on their website. This meant our Aviator's Tour of the PAM only cost $35 for the two of us instead of $70. This deal was advertised on their home page and is still up there as I'm writing this post today so be sure to check before visiting! Another option is the Go Oahu Pass or Smart Destinations Build Your Own Pass. We used the Build Your Own Pass when we went to Waimea Valley and the Dole Plantation and we could have used it for Pearl Harbour as well. 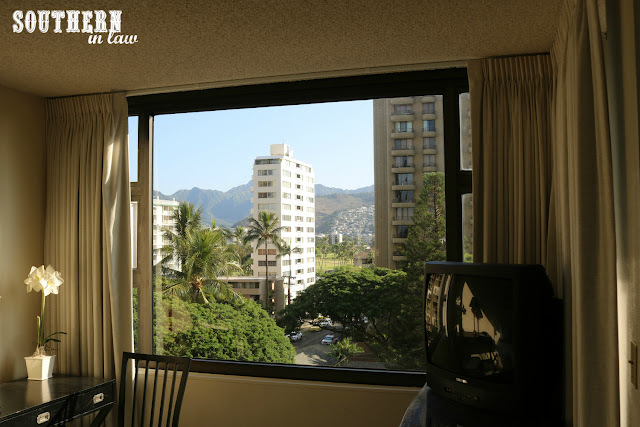 The Go Oahu Pass is for a set number of days where you can do as many of the activities as you can fit within the days - or the BYO pass you can purchase activities and use them within a 30 day period. As Pearl Harbour is a US Navy operated site, they do take security seriously. Bags cannot be taken onto the site (that includes the visitors' centre) so you have to either leave them at your hotel etc or cloak them in their bag holding room outside for $4 per bag. The first time we visited we cloaked our bags but the second time we left everything at our hotel and brought only our camera, phones and wallets. Lunch options are limited so we also packed lunches and left them in the car to head back to the car and eat lunch between tours. Are you a museum/history fan? Do you usually like to walk around yourself or do a guided tour? And what's the best museum you've been to? We used to always do our own thing - but now we've decided guided tours are the way to go when they're a budget friendly option! SO much more informative!